If you’ve ever watched someone turn a simple piece of paper into a complex master piece using the Japanese technique known as Origami you were probably quite impressed, but I doubt you ever thought you could become an Origami master yourself. Well you can if you have an app to help you step-by-step. Origami Instructions - Easy Learn How to Fold Paper Figures does exactly that. It walks you through each step. This is a free app and it’s compatible with iPhone, iPad, and iPod touch. ORIGAMI EASY. HOW TO FOLD PAPER AND MAKE ART. It really is amazing what you can create with a simple piece of paper. For those of us who lack a creative/artistic flair this isn’t something we would ever picture ourselves doing, but with a simple little app we can. 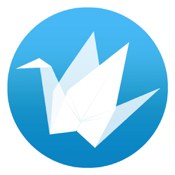 It’s much easier to create an object using Origami if you have a step-by-step guide. It’s a great activity do with the kids on a rainy day. It’s fun, and should help to keep you sane by avoiding the “I’m bored” comments. This app is simple and seemed to be glitch free, but I thought the instructions could have been a little easier to find. Don’t get me wrong they are there, and they do provide quality instruction on the basics of Origami, they just don’t jump out at you when you open the app. They’re actually tucked away in the top left corner. Here you’ll find the word guide highlighted in small blue letters. This is where the basic instructions can be found. They are there, they’re just not obvious. The app requires 14MB of available space on your iOS device to download. Using the app is easy. It’s best to start with the guide. Familiarize yourself with the basics first, and you’ll be better prepared when you actually start on your first real Origami project. Once you feel you’re ready you can return back to the main screen. Here you’ll find an easily navigable list of available projects. There are quite a few free ones, but to unlock the rest you’ll have to purchase them at a cost of $3.49. This seemed a little steep to me for some simple Origami instructions, but if you feel they’re worth it there’s plenty more to choose from. Once you’ve picked out a project you want to try all you have to do is tap on it to get started. The main list will tell you if the project is rated as easy or hard, and it will also tell you how many steps are required to complete the project. I found it helpful to know what you’re getting yourself into before you start the project. Once you access a project the navigation is pretty simple. You’ll notice two arrows at the bottom – one pointing forward and one pointing back. Tap on these to move within the project. If you weren’t sure of a step and you’ve already moved forward, simply tap on the backwards pointing arrow to go back to the last step. Once you’re finished you can choose to rate the project or like it on Facebook if you want. Otherwise tap on back in the top left corner and you’ll be returned to the main screen: that is after being required to view a full-paged ad. This is a fairly simple app to use, but the basic instructions could have been easier to find. Once you figure it out though, it is easy to navigate and there is a decent selection. If you’re looking for something to do with the kids on a rainy day it’s probably worth downloading.